In my last post, I wrote that I was planning to measure the mite level in my remaining surviving hive and would report back the results. The result is that there is no surviving hive. No, I didn’t kill them in the process of testing them, they were dead when I got there, likely of the same cause that we think killed the first hive, mites. Alyssa just dropped me an e-mail and said her hives didn’t make it either. We are both sad. But what do you do? Back on the horse. The good thing to come out of this is that I got lots of good info on how to handle mites from readers of this blog. Out pointed me towards Randy Oliver’s Scientific Beekeeping site, which does a great job of boiling down all the latest thinking on beekeeping, pulling from journal articles, over the fence chatter and everywhere in between. There’s a nice graph in his article on Varroa management strategy, for example, that illustrates why my healthy hives were such perfect targets for mites. 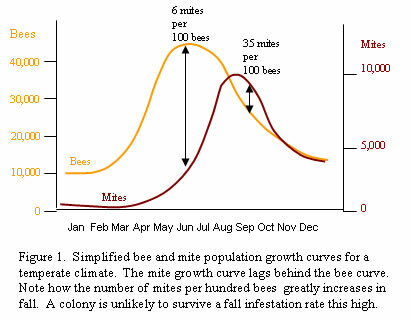 With the mite population curve mirroring the bee’s, just a few months behind, you can see how the bee’s natural thinning at the end of summer fatally coincides with the peak of the mite population. Ouch. So what’s to be done? I think we’re all agreed that chemical solutions, even if they weren’t anathema to to the small farm, organic ethic that so many of us hold dear, just isn’t effective in the long-term. Just as bacteria is becoming immune to the antibiotics we’ve been using for years, so the mites are becoming immune to chemicals we’ve using on them. Scientific Beekeeping has a lot of good advice. It sounds like a combo of strategies is needed, but a key one is drone removal. Mites live in cells with larva of the bees and apparently, they’re much more productive in drones cells than in worker cells, by a factor of 10 to 1! So, if you eliminate or reduce drone brood during the critical period for mites, you can reduce your mite count immensely. It’s definitely going to be more effort-intensive than my beekeeping efforts have been thus far, but I’m kinda getting tired of this whole dying off thing. I’m over it. Ready to move on to living through the winter. For now, though, I’ll just clean up the equipment and put in my order for another two colonies for April. We have a birdbath in the backyard with one large piece of coal in it to keep it from blowing away. The bees are attracted to it like it is something special… There are always several (like 50 or so) hanging on to the coal. I’ve never heard of bees being attracted to coal. Any ideas why? You can re-use the hive. The mites won't survive months without hosts. And, in any case, your new hive will get mites anyway because they're everywhere and unavoidable. Foulbrood is a different story: it's a virus, you need to burn the hives bodies.